This isn't the Halloween post I had wanted to make. The original plan was to do something rather bold (read as: utterly insane) with twelve pumpkins. Maybe next year. Never stop thanking God for what He has given you. You have no idea how truly blessed you are, to have someone to spend your life serving, cherishing, honoring, and treasuring. Don't let a day go by that you don't thank God for that. Don't let a day go by that you don't thank her for being in your life. And if you are so blessed as to be a father, never EVER take that for granted! There are some guys out there who would do just about anything, to know what it's like to be the father to a child, if only for just one day. I have most wanted to be a husband and a father. I don't know if that will happen now. It will be the greatest disappointment of my life to have never held a child in my arms, to have loved and comforted it as a father. I will probably never know what it's like to do the "tea party" with a little girl or be there for a son's game. I won't know what it's like to guide and nurture my children and do my best to encourage them to love God and to love others. I dreamed for so long of a home built on love, not one ruled by fear. And now, I don't see that happening. If you are a husband who has been blessed with a wife, if your are the father of sons or daughters, if you have a home devoted to serving God and each other... then never cease to be thankful for that. You have been given more than all the wealth of this world put together. You have a joy that some pray for but will never know. Don't ever forget that. I have only always fought hardest for those things which I have held most precious and dear. I do not know how to be otherwise. Tom Clancy was one of the first authors who I would eagerly await the next novel from. I was a high school sophomore when the film adaptation of The Hunt for Red October came out and I read the novel soon afterward. I spent the next several months and into the summer devouring everything Clancy that I could find. The night before Hurricane Katrina hit, I curled up with my newly-bought copy of Executive Orders and by the time the storm's outer bands were hitting I couldn't have cared less: Clancy had engrossed me again. Tom Clancy was a pure American... I'm not going to just say "writer" but also, just leave it at "pure American". What do I mean by that? This is a guy who had dreamed as a kid of being a pilot in the United States Navy. What kept him from having that dream was an eye condition that instantly disqualified him. Clancy wound up going into the insurance business... but he never quite gave up on his dream. What did he do? He started reading and researching United States military aircraft and naval vessels. He learned everything he could about the government and military of the Soviet Union. And then he set out to write what President Reagan would later call "the perfect yarn". Almost thirty years later and The Hunt for Red October is arguably the definitive novel of modern naval warfare. As well as being one hell of a gripping story. He couldn't be in the Navy, so he made a phenomenally successful career out of writing about the Navy. And along the way became perhaps the most prominent icon of the modern Navy. How many other places in the world could someone have an opportunity to do a thing like that? 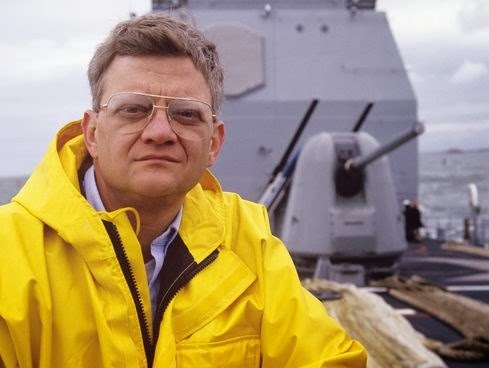 Tom Clancy - who gave us Jack Ryan, Marko Ramius, John Clark, Ding Chavez and many other characters in a genre he made all his own if not created single-handed - passed away Tuesday. He was 66. At the time of his passing he had another novel due out later this year. Thoughts and prayers going out to his family. Think I'll watch The Hunt for Red October tonight in his memory.